The story has a recurring theme as the mouse meets a series of different animals who all tell him that he is good enough to eat. Each time the mouse replies that it’s awfully kind but he is having a feast with the gruffalo! 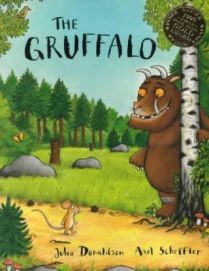 Unsurprisingly no one knows what the gruffalo is like so the mouse starts and continues to build on an amazing description – terrible tusks, terrible teeth and terrible claws, knobbly knees, a poisonous wart on the end of his nose and so on! As you can imagine the gruffalo is sounding pretty scary! So it’s all going very well until all of a sudden our little mouse comes across a very strange creature with terrible teeth and knobbly knees, etc … Yes you’ve guessed – it is a gruffalo! The gruffalo takes one look at the little mouse and declares that he would taste very good on a slice of bread! Time for some more quick thinking! So the mouse squares up to the gruffalo and tells him that it’s not a very good idea because he (the mouse) is the scariest creature in the wood and to prove it he gets the creature to follow him. Of course, when the other animals spot them they all run away! The gruffalo believes it is because of the mouse so begins to get a bit nervous especially when the mouse says that his favourite dish is gruffalo crumble! That’s the final straw and the gruffalo runs off leaving the mouse to enjoy the peace and quiet of the wood. Both my daughters really love this book. They have active imaginations at the moment, so they love the way the mouse describes the gruffalo, and often have some ideas of their own to add. They also get the joke that the mouse plays – realising that it is really the gruffalo that all the other animals are afraid of and not the mouse! Also, they like the way that the little mouse is so brave and does not just give into his enemies. As I said at the beginning, this book is written all in rhyme which works really well. Having read it a few times, my daughter is very keen to complete the rhyme and she is becoming very good at it. Also because there is quite a predictable pattern in the story she is able to join in with a lot of the words, and also enjoys anticipating what is going to come next. The illustrations in the book are excellent – they all match the words on the page particularly the description of the gruffalo. However even though the gruffalo is meant to be pretty scary, because the illustration is quite amusing, it is not off putting to little children. The illustrator is Axel Scheffler, who I think has illustrated most, if not all, of Julia Donaldson’s books. This is good, because all the books have a certain familiar feel to them. Overall this is a fantastic book for small children that is likely to become a firm favourite very quickly!